Did you know the first public signs of the iPhone were way back in 1999, when Apple registered iPhone.org. 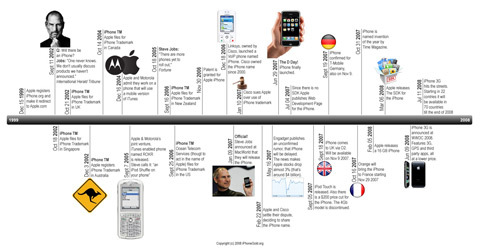 Silver from iPhoneGold has put together a great timeline showing the history of the legendary iPhone, including domain registrations, trademarks. the famous 3% stock drop all the way up to the new iPhone 3G. Full sized iPhone timeline here, thanks Silver for spending a worthwhile couple of days researching and putting this together.